The stupid things drunk people do in bars never fail to amaze us. Like stealing tables, writing on our building and busting our toilet. Last night was no exception. We've been kind enough over the years to let customers go upstairs and hang out on our beach, take pictures and escape from the craziness of the downstairs bar. Unfortunately, over the past few years, customers have become more and more disrespectful of this space. Usually after people have been up there, we find the space trashed- popcorn flung everywhere, glasses left behind, and general disarray. Last night, a group of people went up there while the doorguy had stepped away from the door. Awhile later, after they had left the bar, John went upstairs and discovered the worst mess of all: someone had deployed the fire extinguisher. The story could end there, with Dave and John staying even later than usual, cleaning up a mess. But it doesn't. The idiot who made the mess moved on down the street to Tonic, where apparently he bragged about his adventure at the Sandbar. He bragged about it to the wrong person, because that person happened to know Dave. And that person took the time to come over to the Sandbar and tell Dave what happened, and the two of them went and tracked down the idiot on Mass Street. Dave informed him that he had two options: they could call the police, or he could come back to the bar and clean up the mess he made. He wisely chose to come clean up the mess. Of course, Dave will still have to clean it himself, because fire extinguishers create a tremendous mess and the drunk guy didn't exactly do a bang-up job of cleaning, but at least Dave made a point. And then, when the guy was done "cleaning," Dave informed him that he also owed the bar money so that we could replace the fire extinguisher. The guy balked at this, and then had the audacity to say he'd only deployed half of it, and could he then go and deploy the other half outside? Uh, NO. The irony in all of this? Our fire extinguishers had just been refilled on MONDAY. The day before. There's a lesson here. Be respectful of the businesses you visit. Being drunk isn't an excuse, either. Don't be a jerk and ruin the fun for everyone else. Because from now on, customers are no longer allowed upstairs. Here's a funny and slightly obnoxious JibJab greeting we made just for you. Enjoy! We're open Thanksgiving night if you get bored with your family. Hey, Stupid. Don't Steal Our Table. Dear smart guys, not the brightest move to try and steal the Red Stripe table. Running with a table is a lot slower than without one. Hope you had a good night in jail. Lots of comments and likes on that one. That night was like a full moon without the full moon. Two guys came in the bar to meet some friends. Later that night, out of the corner of his eye, Dave saw one of the guys hop over the patio railing and another guy lifted the patio table over the rail to him. Dave yelled at doorguy John to get the table. John and about five customers took off after the guys. One by one, the thieves peeled away from each other- eventually leaving just one poor shmuck hauling the table by himself. This table's not light, either. Our crew of table-rescuers eventually caught up to the guy and knocked the table out of his grip. As luck would have it, a police officer was parked half a block away. He came over, cuffed the guy and took him away. The kid came in the next day and apologized for "the incident." Kudos to him for stepping up and making the apology, we appreciate it. Merry Christmas from The Sandbar! We love Elf Yourself so much we had to do it again- especially when we saw the new surfing elves video they added this year! It's perfect for the Sandbar! We hope you're all enjoying the holiday season and spending time with your loved ones. But when you get tired of them, or if you're tired of hanging around the house, remember that we'll be open at 8 p.m. Christmas night. Bring your family out, or come out and meet your friends! We're mostly recovered from the long Halloween weekend- our party bus extravaganza, the pre-party on Saturday and the actual holiday Sunday. We recapped our Rocky Horror festivities already, and you can find pictures on our Facebook page and Flickr. Unfortunately, your reporter on all things Sandbar was tired on Saturday, so I didn't take very many pictures of the Halloween party. Dave, as usual, came up with a fantastic and unique idea: a rodeo clown. Complete with a cut-off pair of size 62 jeans, rainbow suspenders and face paint. Andrew was a nerd; John was a Top Gun character. Almost everyone in the bar was in costume, too. We had cheerleaders, baseball players, Lucille Ball, Dora the Explorer, Fred Flintstone and a viking woman. Princess Leia and Obi-Wan-Kenobi even made an appearance. As usual, we forgot to do any sort of costume contest. As usual, no one noticed. Halloween night, sadly, was slow. We had some repeat customers from the night before, and even some folks who wore three different costumes, three nights in a row. Bartender Fyler was a shark! Apparently his mom made a shark costume for him long before he ever worked at the Sandbar; it must be fate. Best costume of the weekend, from my perspective: Tom and Kara as Angry Birds, even though they didn't actually stop by the Sandbar. But they made the costumes themselves, and at the last minute on Saturday. For those of you unfamiliar with Angry Birds, it's an apparently highly-addictive game you can play on a smartphone. We'd love to see your Halloween pictures. 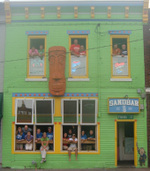 E-mail them to us at sandbar@thesandbar.com, or upload them to our Facebook page. Last night, Dave got a phone call. "Did you pull money out of the change bank when you were here earlier?" Joe asked. "Well, I know there was a hundred dollar bill in there. I saw it earlier. And now I can't find it anywhere." Dave sighed and drove back to the bar to look for the missing money. Between him, John and Joe they tore the place apart. They looked under the register, between the liquor bottles and in all of the usual "hiding places" things disappear into at the bar. And believe me, things disappear. And a hundred dollars is kind of a big deal. No luck. Finally, Dave pulls out the ones and fives from the register to count them yet again. Halfway through the bundle of five dollar bills, he found the missing hundred. "That's nuts. I swear I counted that bundle earlier and that bill wasn't there," said John. "This six foot nine dude came in all ticked off. He was really drunk. I tried to stop him from coming in, but he was too powerful. He was really angry. Danny tried to stop him, he punched Danny in the head, we called the cops, and they hauled him out. Then he started serving drinks."